What? A new tectonics model named "Talon". Kind of looks like the Select S09... I guess it is made for slalom somewhere between goldwing and tomcat, or the new Goldwing? It is G10, soo I guess the profile has to be thick compared to Select/deboichet. I guess this powerfull design could be sailed a size shorter. quite a good speed, who knows more??? 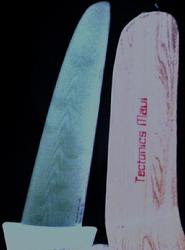 Also found out Micah Buzianis is using the tectonics talon in PWA 2009.